Andrew McCabe, the former deputy FBI director and frequent target of President Trump, who was recently fired days short of retirement, has been referred for criminal prosecution by the Justice Department Inspector General. Although former prosecutors described the referral as routine, it comes in the context of McCabe’s extraordinary status as a frequent scapegoat for the president’s legal woes. A recent IG report found that McCabe “lacked candor” in his conversations with internal investigators about a fall 2016 story, which confirmed the existence of an ongoing probe of the Clinton Foundation during the presidential election. 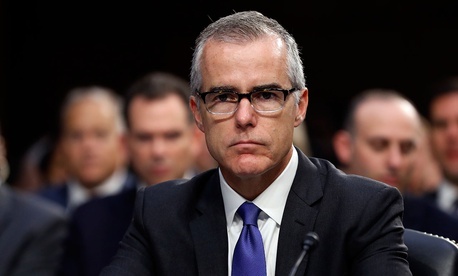 McCabe has said he was acting to defend the Bureau’s reputation, but the IG report concluded that McCabe was defending himself when he authorized disclosing a conversation with a Justice Department official to a Wall Street Journal reporter, in which McCabe felt he was resisting pressure to slow-walk the Clinton probe. The report also found that McCabe misled investigators about his role in that disclosure. Despite the fact that that story reflected negatively on Clinton rather than Trump, the president has fixated on McCabe because of his wife’s unsuccessful run for state office in Virginia as a Democrat. McCabe has denied lying to Justice Department investigators. McCabe’s attorney, Michael Bromwich, released a statement Thursday afternoon saying they had been told of the referral. “We are confident that, unless there is inappropriate pressure from high levels of the Administration, the U.S. Attorney’s Office will conclude that it should decline to prosecute,” he said. News of the referral was first reported by The Washington Post. Special Counsel Robert Mueller is currently investigating potential links between the 2016 Trump campaign and a Russian influence operation aimed at electing Trump, as well as potential obstruction of justice in connection with the president’s decision to fire former FBI Director James Comey last May. Trump has portrayed that inquiry as a “witch hunt” and accused the Bureau of being biased against him, an allegation for which there is scant evidence. Nevertheless, David Gomez, a former FBI agent who is now a cyber and homeland-security fellow at George Washington University, said the president’s attacks were taking their toll.